that friendship sees us through, that kindness persists....especially in our day and times. Barbara paints for and from her soul. Her intent is to convey an experience, a story or emotion. 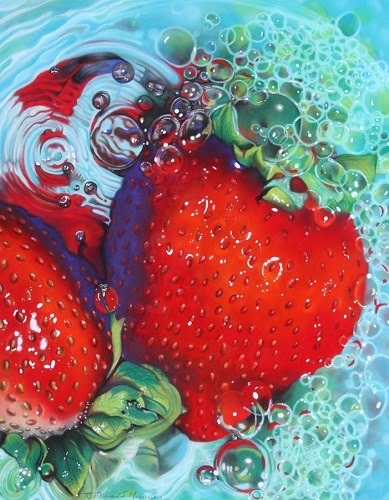 She enjoys painting in a photo-realistic style, whether she’s using pastels sticks or transparent watercolor paints. She achieves the vibrancy of depth and rich color of each painting by adding numerous layers of color juxtapose an often darker background. greeting cards, note cards, calendars and various stationary products. distributes ultrasound recordable greeting cards for expectant mothers and families. Barbara’s artwork is currently represented by XANADU GALLERY in Scottsdale, Arizona, and THE ARTIST OF TEXAS. In addition to painting full time, she is currently the owner of Sound Integrity, where she is an advanced OB/GYN, Diagnostic and Vascular ultrasound specialist. During her 27-year career in radiology, she was the former Ultrasound Department Manager and Ultrasound Clinical Instructor in Illinois. In her spare time she enjoys interior designing, gardening, and listening to jazz and gospel music. Noted artists such as Don Landry, Dean Mitchell, Steve Hanks, Poncho Brown and Sandy Meyer have fueled her artistic abilities. I want you the viewer to experience the emotions that inspire me. I choose subjects with poise, attitude and uniqueness. and absorb the richness of the colors as they come alive on paper. to the process. Each painting is one step in my journey as an artist. Enjoy the vibrant palette of my life!